These days it seems like you cannot go into a store without seeing the words organic or gluten free everywhere you look. Thanks to the amount of competition in natural food production, it may be tempting to want to declare your food bars as “All Natural” or “Organic” as well. Surely you have heard the saying “The proof is in the pudding.” Well in this case, the proof lies within your food bar. If you want to make certain claims about your bars, they must be tested and certified. Let’s take a look at the different types of certifications you can obtain. There are a number of different reasons to use a contract manufacturer. While production volume is a concern, it is important that the quality is consistent and that the facilities are held to strict cleanliness standards. These standards are what is known as GMPs, or Good Manufacturing Practices. Generally, facilities use a 3rd party to audit the GMPs they use in their facility. Here at Element Bars, we are proud to say we took the standard 3rd party GMP audit to another level. In 2016 Element Bars attained SQF certification by meeting globally recognized food safety standards and procedures. 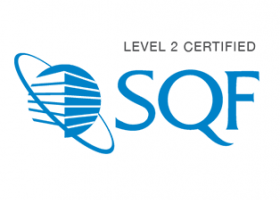 With a score of 90.0%, our facility is in good standing with the SQF code. Many retailers, including Target, Walmart, and Costco require food they handle to be manufactured in a facility that meets these global food safety standards. Element Bars is the perfect place to start if you are looking to retail your bar in these stores. Additionally, an SQF certification also means that Element Bars is compliant with FDA regulations. Consumer demand for healthy, organic, and gluten free products has risen over the past decade. While some manufacturers may not be able to offer organic and gluten free certifications, Element Bars has risen to the challenge. Element Bars is certified organic by CCOF (California Certified Organic Farmers). This is why many products made in the Element Bars facility bare the USDA Organic button. Due to the rigorous CCOF audit standards, which include a facility inspection, the dollar amount of certification can be considerable. The cost of certification increases depending on how many certified organic clients we have. Since Element Bars pays for the inspection at its own cost, the price to add a private label to our production is roughly $1,000 per year. This fee is passed on to the customer, should they choose to be certified organic. We at Element Bars understand that this cost is necessary to provide our clientele with the most natural products possible. When producing food items, there may be some religious considerations to take into account, most commonly is whether or not the food is kosher. Unlike the other certifications mentioned, being certified kosher is all or nothing. You cannot run kosher product lines in a facility that runs non-kosher products. Since every ingredient needs to be certified, we decided we would rather provide our clients with a wide array of ingredients to allow them to be as creative and versatile as possible without restriction.